So, you’ve found out you’re going to have a baby…Congratulations! Finding out you’re going to be a parent can make you feel many different emotions – happiness, excitement, anxiety, and even fear are all normal things to feel. 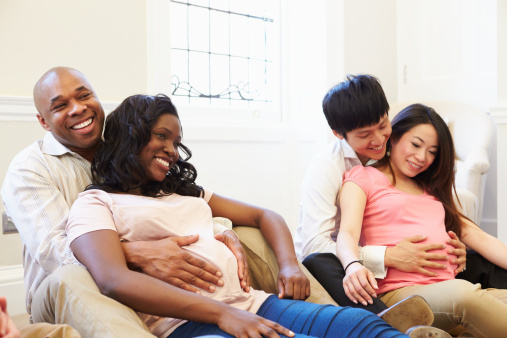 Here are some things to think about and do from the Eunice Kennedy Shriver National Institute of Child Health and Human Development before having a baby. What can I do to promote a healthy pregnancy? Getting early and regular prenatal care is the best thing you can do to keep yourself and your developing infant healthy while you are pregnant. Begin or continue to get at least 400 micrograms of folic acid by taking vitamin supplements every day to reduce your child’s risk of neural tube defects. In the United States, enriched grain products such as bread, cereal, pasta, and other grain-based foods are fortified with folic acid. A related form, called folate, occurs naturally in leafy, green vegetables and orange juice, but folate is not absorbed as well as folic acid. Also, it can be difficult to get all the folic acid you need from food alone. Most prenatal vitamins contain 400 micrograms of folic acid. If you have had a child with an NTD before, taking a larger daily dose of folic acid (4 mg) before and during early pregnancy can reduce the risk for recurrence in a subsequent pregnancy. Drinking alcohol and smoking during pregnancy can increase your child’s risk for problems such as fetal alcohol spectrum disorders (FASDs) and Sudden Infant Death Syndrome (SIDS). FASDs are a variety of effects on the fetus that result from the mother drinking alcohol during pregnancy. The effects range from mild to severe, and they include intellectual and developmental disabilities; behavior problems; abnormal facial features; and disorders of the heart, kidneys, bones, and hearing. FASDs last a lifetime although early intervention services can help improve a child’s development. FASDs are completely preventable. If a woman does not drink alcohol while she is pregnant, her child will not have an FASD. Currently, research shows that there is no safe amount of alcohol to drink while pregnant. According to one recent study supported by the NIH, infants can suffer long-term developmental problems even with low levels of prenatal alcohol exposure. SIDS is the sudden, unexplained death of an infant younger than 1 year old. It is the leading cause of death in children between 1 month and 1 year of age. Most SIDS deaths happen when babies are between 1 month and 4 months of age. Drinking or smoking during pregnancy increases the risk of SIDS; also, infants exposed to secondhand smoke are at greater risk for SIDS. Your health care provider can be a source of help if you find it hard to quit smoking or drinking on your own. Talk to your health care provider about medications. As many as half of women take four or more medications during pregnancy. Although many are safe, talk to your health care provider before taking any over-the-counter or prescription medication or herbal supplements. Certain medications to treat acne and epilepsy and some dietary or herbal supplements are not safe during pregnancy. Avoid exposure to toxic substances. During pregnancy, exposure to radiation, pesticides, some metals, and certain chemicals can cause birth defects, premature birth, and miscarriage. If you’re not sure if something might be harmful to you or your fetus, avoid contact with it until you check with your health care provider. If you work in a job on a farm, a dry cleaner, a factory, a nail or hair salon, you might be around or come into contact with potentially harmful substances. Talk to your health care provider and your employer about how you can protect yourself before and during pregnancy. You may need extra protection at work or a change in your job duties to stay safe. Choose a variety of fruits, vegetables, whole grains, and low-fat dairy products to help ensure the developing fetus gets all the nutrients it needs. Make sure you also drink plenty of water. An online tool called the Daily Food Plan for Moms can help you plan your meals so that you get the right foods in the right amounts according to your personal characteristics and your stage of pregnancy. Read Nutrition During Pregnancy FAQs from the American College of Obstetricians and Gynecologists to learn more about how much you should eat during pregnancy, the nutrients you need, and how much caffeine is safe to drink. Avoid certain foods such as raw fish, undercooked meat, deli meat, and unpasteurized cheeses (for example, certain types of feta, bleu cheese, and Mexican-style soft cheeses). Always check the label to make sure the cheese is pasteurized. Some pregnant women are concerned about the amount of fish they can safely consume. Certain fish contain methylmercury, when certain bacteria cause a chemical change in metallic mercury. Methylmercury is found in foods that fish eat, and it remains in the fish’s body after it is eaten. Methylmercury in fish eaten by pregnant women can harm a fetus’s developing nervous system. According to the U.S. Food and Drug Administration (FDA), pregnant women can eat up to 12 ounces a week of fish and shellfish that have low levels of methylmercury (salmon, canned light tuna, and shrimp). Albacore (“white”) tuna has more methylmercury than canned light tuna; pregnant women should consume 6 ounces or fewer in a week. Avoid fish with high levels of methylmercury (swordfish, king mackerel, and shark). For more information on methylmercury and pregnancy, see the FDA Food Safety for Moms-to-Be. Some studies suggest that too much caffeine can increase the risk of miscarriage. Talk to your health care provider about the amount of caffeine you get from coffee, tea, or soda. Your health care provider might limit you to 200 milligrams (the amount in about one 12-ounce cup of coffee) per day. Keep in mind, though, that some of the foods you eat, including chocolate, also contain caffeine and contribute to the total amount you consume each day. Talk to your health care provider about physical activity. Most women can continue regular levels of physical activity throughout pregnancy. Regular physical activity can help you feel better, sleep better, and prepare your body for birth. After your child is born, it can help get you back to your pre-pregnancy shape more quickly. Talk to your health care provider about the amount and type of physical activity that is safe for you. Gaining too much or too little weight during pregnancy increases the risk of problems for both the mother and the infant. Following a healthy diet and getting regular physical activity can help you stay within the recommended weight gain guidelines set by the Institute of Medicine. Women who are underweight (BMI less than 18.5) should gain between 28 and 40 pounds. Women at a normal weight (BMI between 18.5 and 24.9) should gain between 25 and 35 pounds. Overweight women (BMI 25 to 29.9) should gain between 15 and 25 pounds. Obese women (BMI more than 30) should gain between 11 and 20 pounds. In a recent NICHD study of more than 8,000 pregnant women, 73% gained more than the recommended amount of weight. The study found that excessive weight gain during pregnancy increases the risk for gestational high blood pressure, cesarean section, and large-for-gestational-age infants. Talk to your health care provider about the right amount of weight gain for you based on your pre-pregnancy weight. Talk to your health care provider about taking vitamin B12 and iron supplements. Iron supplements can help reduce your risk for anemia resulting from iron deficiency, which is common during pregnancy. Your health care provider may also recommend a vitamin B12 supplement if you are a vegetarian or vegan. Your gums are more likely to become inflamed or infected because of hormonal changes and increased blood flow during pregnancy. Make sure you tell your dentist if you think you could be pregnant, but keeping up your regularly scheduled checkups is important. Some women may fear getting dental work during pregnancy, but a 2006 study and 2011 follow-up study showed no increase in preterm births or other adverse outcomes for pregnant women who received dental care. If you could use some support navigating health insurance, finding a provider or services, or learning more about healthy behaviors, call your local Community Health Worker at 315-272-2661. Community Health Workers (CHW) assist women of childbearing age on improving their health, as well as the health of their family. This is an outreach and home visiting program that serves Oneida and Herkimer county residents. CHWs work with high need women and infants to obtain health insurance and engage in healthcare. CHWs educate, refer and follow up to ensure success in making healthy decisions, reducing risky behaviors and encouraging overall wellness.